What is the best white board paint you can buy in 2019? That’s exactly what we will look into today. Dry erase paint products are entering the market at different price points, and each has their pros and cons when it comes to overall performance. Essentially you should aim for a whiteboard paint kit that is odorless, easy to apply and does not leave annoying traces of ink from previous use. To give you the low down on what’s available, we have reviewed and rated 5 top selling dry erase paints currently available. For our findings at a glance, just head to the table below. For an in depth review of each of our picks, plus a detailed buyer’s guide, keep on reading. There are different types, brands, and colors of dry erase wall paints. Still, these paints can be rated based on their formulation quality, warranty, (white-board) finish quality, durability (how long they stay on the wall), odor, cost-performance benefits, compatibility with different marker pens, and how long it takes for the paint to dry completely. Based on these rating criteria, 5 of the best dry erase wall paints have been identified and chosen for review. This a high-quality, environmentally-friendly, and odorless water-based dry erase wall paint that comes as a two-component product, with the components labeled as Part A and Part B. These are formulated according to the provided instructions to create a superior glossy finish with minimal glare. This durable paint comes in 2 colors; white and clear (transparent). It is designed to create the traditional white-board effect on the painted surface, as well as maintain a high erasability quality that allows markings made by marker pens or crayons to be fully erased from the wall. Moreover, it has a low VOC count which makes it non-toxic even when it comes in contact with human skin, and such stains can be washed off easily using water. It is recommended that one uses low-odor markers on the painted wall. This paint takes between 36hours to 48hours to dry completely, and thereby convert the wall into a ready-for-use white-board. This product is designed and manufactured by the premiere and high-reputable dry-erase paint maker, ReMarkable Coating. This dry-erase paint comes in 5 well-packaged size kits which cover surface areas ranging from 50square feet to 600square feet (Sq.Ft). The package of each kit contains the following; a stir stick, 1/4-inch Nap Roller attached to a Roller Frame, roller cover, hand gloves, instruction manual, Fiber-cloth eraser, Dry-erase marker, and most importantly, the Part A and Part B paint components. and the 600Sq.Ft Kit comes with 1893ml of Part A and 3785ml of Part B. Apart from the 35Sq.Ft kit, the ratio of Part A to Part B in all the other kits is 1:2. Regarding area measurements, the rule of the thumb is that a gallon of ReMARKable paint covers 400Sq.Ft of wall area. These items are placed inside a tall white rectangular box package that has a carrying handle protruding through its top. To use this paint, one must first identify the desirable color. Afterwards, prepare and prime the wall surface properly. Then measure the area to be painted as this measurement guides the choice of kit to be purchased. After purchasing the right kit, open the 2 paint containers and mix the 2 components in a mix container according to the instructions laid down in the instruction manual. Part A and Part B of the paint does have a faint odor before mixing, but when the mixing is done properly, a white odorless mixture with even consistency is achieved. This formulated and ready-to-use paint is poured into a roller pan. Afterwards, a 1/4-inch Nap Roller is dipped into the pan and saturated with the paint, which is then painted on the wall as a single coat. This means that once the paint has been rolled over an area, there is no need to paint that area again as the single coat achieved is adequate. The entire mixture must be used as it cannot be stored. This paint feels dry to the human touch 8hours after painting, and is ready for use 48hours after painting was completed. ReMARKable dry-erase paint produces a beautiful and well-glossed finish that fits in with the room interior décor. Both the clear and white paints create a superior white-board surface that is immune to ghosting or ghosting-like effects. The clear paint also never yellows. If this dry-erase wall paint stains any surface, including human skin, it can be cleaned up using water and mild soap. Still, the paint feels sticky to naked fingers and if it falls in the hair, it is recommended for one to wash it away as soon as possible before it causes the hair to entangle or stick together. If the paint is not to be used immediately, it can be stored as an unmixed formulation. Unopened, original containers have a shelf-life of 6months. The recommended storage temperature of Part A ranges from 7 to 25 degrees centigrade; while those of Part B range from 4.44 to 50 degrees centigrade. ReMARKable comes with 10years guarantee. Painting requires only a single coat. Sticks to naked human skin or hair. Works best only with low-odor markers. 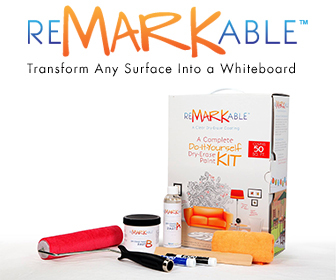 ReMARKable Whiteboard Paint is a high-quality, environmentally-friendly, and low-odor water-based dry erase wall paint that comes as a two-component product that creates a superior writable surface with minimal glare. This durable paint comes in 2 white and clear colors; and is designed to create the traditional white-board effect on the painted surface, while maintaining high erasability quality. It requires 48hours to dry completely. The smooth formulation quality, 10-years warranty, outstanding (white-board) finish quality, durability, low odor, unrivaled cost-performance benefits,, and short drying duration makes ReMARKable Whiteboard Paint the best dry erase wall paint in this review. These are high-quality, environmentally-friendly, and low-odor dry erase wall paints that supports HVLP spray application for professional painters. They come as two-component products, with the components labeled as THAT (Part A) and THIS (Part B); which when formulated according to instructions can be rolled on the wall. These roller-applied, single coat paints create a superior glossy finish with minimal glare. However, this glare is more reflective than the faint glare of ReMARKable Whiteboard Paint. IdeaPaint Pro Series are durable paints that comes in 2 colors; white and clear (transparent). They are designed to create the traditional white-board effect on the painted surface, as well as maintain a high erasability quality. They have low VOC count which makes them non-toxic. The wet walls take 7 days to dry completely and be used as writable surfaces. It is recommended that only dry-erase markers are used on the painted surfaces. These products are designed and manufactured by the premiere and high-reputable dry-erase paint maker, Idea Paint. This dry-erase paints comes in well-packaged size kits that are designed to paint an area covering 40Sq.Ft. The package of each kit contains the following; a 9inches wide roller, instruction booklet, the THAT container and the THIS tube. These items are placed inside a tall white rectangular box package. It is recommended that professional painters should apply this paint as they can properly use a High-Volume, Low-Pressure (HVLP) spray gun to evenly apply a single homogeneous coat over the chosen surface. To use this paint, one must first identify the desirable color. Afterwards, prepare and prime the wall surface properly. Then measure the area to be painted and they buy the required number of IdeaPaint Pro paint kits. Then open the THIS tube and pour its content into the THAT container, and mix the 2 components according to the instructions laid down in the instruction manual. During the mixing of Part A and Part B, a strong choking odor can be produced but the odor intensity gradually declines as the parts mix into a white homogeneous mixture of glue-like consistency. This formulated and ready-to-use paint is then poured into a roller pan. Afterwards, the Roller is dipped into the pan and saturated with the paint, which is then painted on the wall as a single coat. During the rolling process, one can sometimes feel the paint thicken as times lapses with the roller still applying paint. It is for this reason, as well as its strong odor that experts recommend that it is spray-painted by a professional painter. reaches the far end of the surface. The entire mixture must be used as it cannot be stored. This painted surface is ready for use 7days after painting was completed. IdeaPaint Pro Series produces a beautiful and well-glossed finish that fits in with the room interior décor. Both the clear and white paints create a superior white-board surface that is immune to ghosting or ghosting-like effects. Also, the clear paint can never yellow, while the white paint never fades. IdeaPaint Pro Series comes with 10years guarantee. Works best with dry-erase markers. Difficult to apply with a roller. Does not completely erase if low-odor markers are used. Produces more glare than ReMARKable Whiteboard Paint. IdeaPaint Pro Series are high-quality, environmentally-friendly, and single-coat dry erase wall paints that come in clear and white colors, with both colors supporting HVLP spray application for professional painters. They come as two-component products, with the components labeled as THAT (Part A) and THIS (Part B); which when formulated according to instructions can create a superior glossy finish with minimal glare. They have low VOC count which makes them non-toxic. They take 7 days to dry completely. This is a high-quality, environmentally-friendly, and single-component oil-based dry erase wall paint that supports both spray painting and roller-based application. It comes only in white color. This paint creates a superior glossy finish with minimal glare. It is designed to create the traditional white-board effect on the painted surface, as well as maintain a high erasability quality. It has a low VOC count which makes it relatively non-toxic. The wet walls take 72hours to dry completely and be used as writable surfaces. It is recommended that only dry-erase markers are used on the painted surfaces. This product is designed and manufactured by Writey Board, and its part number is 30502-PK. This dry-erase paint comes in well-packaged size kits that are designed to paint an area covering 50Sq.Ft. The package of each kit contains the following; a 9inches wide roller, instruction booklet, dry-erase marker, spray cleaner, dry-erase cloth and the paint container. These items are placed inside a tall blue rectangular box package. To use this paint, one must first identify the desirable color. Afterwards, prepare and prime the wall surface properly. Then measure the area to be painted and then buy the required number of Hi-Gloss paint kits. Then pour the formulated and ready-to-use paint in a roller pan. Afterwards, the Roller is dipped into the pan and saturated with the paint, which is then painted on the wall as a single coat. This paint has an odor. Also, during rolling, one can sometimes feel the paint thicken as times lapses with the roller still applying paint. It is for these reasons that spray-painting is recommended. However, this must be done by a professional. It is recommended that 2 coats are painted on the surface. This painted surface is ready for use 3days after painting was completed. Writey Board Hi-Gloss dry-erase paint produces a beautiful and well-glossed finish that fits in with the room interior décor. This white paint creates a superior white-board surface that is immune to ghosting or ghosting-like effects. The painted surface is also resistant to ultraviolet (radiation) rays, and hence cannot fade or yellow. Also, even though this product is sometimes marketed as a single-coat paint, one can still apply it over a painted area in order to improve the gloss and also create a tough scratch-resistant white-board coat. These 2 coats must be made in the same painting session with the painter waiting for about 10-15minutes after the initial coat has been made for the second coat to be applied or sprayed on the painted wall. Packaged in a superb kit. Supports both spray painting and roller-assisted painting. Writey Board Hi-Gloss is a high-quality, environmentally-friendly, and single-component oil-based dry erase wall paint that supports both spray painting and roller-assisted application. This single-coat white paint creates a superior glossy finish with minimal glare. It has a low VOC count. The wet walls take 72hours to dry completely and be used as writable surfaces. This is a high-quality, environmentally-friendly, and single-component oil-based dry erase wall paint that can only be spray painted and is packed in a spray container. It comes in white color, and is sold in a set of 6 containers. It is a dual-coat paint as it requires one to paint 2 coats on the wall surface in order to achieve a durable and ready-to-use writable white-board surface. Likewise, it creates a superior glossy finish with minimal glare. Moreover, it is designed to create a traditional white-board surface that has a high erasability quality. It has a low VOC count which makes it relatively non-toxic. This paint feels dry to the human touch an after painting, and is ready for use 1.5hours after painting was completed. It is recommended that only dry-erase markers are used on the painted surface. This spray paint is designed and made by Krylon. This dry-erase paint comes in compact and well-designed spray container that holds 12ounces or 340grams of the ready-to-use paint. This paint can only be spray-applied on indoor walls. To use this paint, one must first identify the indoor wall to be painted. Afterwards, prepare and prime the wall surface properly. Then measure the area to be painted and then buy the required number of Krylon spray kits. Then spray the paint over the primed wall surface. It is recommended that the spray-painting be done by a professional, especially as the spray containers are sold as stand-alone units without any accompanying instruction booklet thus leaving one with the instructions set on the container wall as the primary source of authoritative assistance. Still, one can contact the authorized dealer or company for further assistance if need be. It is recommended that 2 coats are painted on the surface. This painted surface is ready for use 90minutes after painting was completed. Krylon dry-erase spray paint produces a beautiful and well-glossed finish that fits in with the interior décor. This white paint creates a superior white-board surface that is immune to ghosting or ghosting-like effects. The painted surface is also resistant to ultraviolet rays, and hence cannot fade or yellow. Using two coats gives the surface a good gloss as well as creates a tough, scratch-resistant white-board paint. These 2 coats must be sprayed in the same painting session. Krylon Dry-Erase Paint is a high-quality, environmentally-friendly, and single-component oil-based dry erase wall paint that can only be spray painted and comes inside a spray container. This dual-coat white paint creates a superior glossy finish with minimal glare. It has a low VOC count, and requires only 1.5hours to dry completely. This a high-quality, environmentally-friendly, and low-odor dry erase wall paint that comes as a two-component product, with the components labeled as Part A (which is the Base) and Part B (which is the activator); and when they are properly formulated according to the laid-down instructions, a good glossy finish with minimal glare is achieved. This budget-friendly paint comes only in white and it requires a minimum of 2 coats for it to create a good writable surface. It is designed to create the traditional white-board effect on the painted surface, as well as maintain a good erasability quality. Also, it has a higher VOC count as compared to either ReMARKable and IdeaPaint. Still, it is considered as relatively safe for use. It is recommended that one uses dry-erase markers on the painted wall. This paint takes 48hours to dry completely, and thereby convert the wall into a ready-for-use white-board. This product is designed and manufactured by Rust-Oleum. This dry-erase paint comes in a compact package kit which contains enough paint to cover 50Sq.Ft of the wall surface area. Inside the kit are the Base (Part A) and the Activator (Part B). These items are placed inside a compact green-white rectangular box package. To use this paint, one must first prepare and prime the wall surface properly. Then measure the area to be painted as this measurement guides the choice of how many kits need to be purchased. Afterwards, mix the 2 components of each kit in a mix container according to the instructions laid down in the instruction manual. Part A and Part B of the paint does have a low odor before mixing, but when the mixing is done properly, a white almost-odorless mixture with an even consistency is achieved. Sometimes, bubbles can be seen in a poorly-prepared mixture and this can lead to a poor-quality white board finish. This formulated and ready-to-use paint is poured into a roller pan. Afterwards, a roller is dipped into the pan and saturated with the paint, which is then painted on the wall as a single coat. Next, one waits for about 30minutes and then applies the second coat. If a third coat is desired, one then waits for 30minutes after applying the second coat before applying the third coat. The entire mixture must be used as it cannot be stored as its shelf-life is about 60minutes. This painted wall requires 48hours to dry completly. Rust-Oleum white dry-erase paint produces a beautiful and well-glossed finish that fits in with the room interior décor. This finish is immune to ghosting or ghosting-like effects, and it never yellows. If the paint is not to be used immediately, it needs to be stored as an unmixed formulation. Rust-Oleum White a high-quality, environmentally-friendly, and low-odor dry erase wall paint that comes as a two-component product, which when formulated properly creates a good glossy finish with minimal glare. This budget-friendly paint comes only in white and requires a minimum of 2 coats for it to create a good writable surface. What is dry erase wall paint? The dry erase paint is a special category of wall paint that is used to convert any painted surface, including a large wall, into a white-board. White-boards provide convenient surfaces for jotting down ideas during brainstorming sessions, especially in offices. Like ordinary paints, the dry-erase paint has a liquid composition and needs to be applied as a thin even layer on a substrate, usually a wall surface, and the liquid film starts to solidify as it adheres permanently on its surface. Likewise, before applying the paint, a primer may need to be applied on the surface and this primed surface is then painted into a white-board. This allows one to create a functioning white-board anywhere there is a flat surface. Related Content: The HOVR Review – Does it work or just another gimmick? The latter comes in 2 separate containers that contain the 2 components that need to be mixed to create the ready paint. Single component paints are already mixed, and one only needs to remove the lid and start using the paint. Dry erase wall paints come in various formulations with the 2 main categories being the water-based emulsion paints and oil-based paints. The oil-based paints are further divided into standard oil-based paints and enamel paints (which provide a hard glossy finish). These paints come in various colors with the main color being white, followed by transparent (clear) paints. Clear paints allow the surface to retain its pre-paint color while providing a high-quality white-board for scribbling, writing, and drawing graphs using good (toluene-free and xylene-free) marker pens. It is important to note that white dry-erase paints can only be painted on surfaces that have been primed by a white base coat. High-quality dry erase paints transform the painted surface into white-boards that have a glossy surface with minimal glare. Likewise, such high-quality paints have low amounts of volatile organic compounds (abbreviated as VOCs). VOCs can cause environmental degradation; and if the body is exposed to them, then a medical condition known as organic solvent syndrome. Also, the odor of the paint also matters as strong and choking odor make the application experience uncomfortable. Also, strong odors can linger on even after the paint dries and this results in poor user experience when the white-board is used. Another important factor to consider before purchasing a dry erase paint is how long it takes for the paint film to dry. This allows one to know how many days must pass from the painting day till the surface is ready to act as a white-board. Generally, the shorter the drying period, the better the paint. Dry erase paints can also be used to resolve the recalcitrant problem of ghosting. Ghosting refers to the cumulative process that creates a permanently stained white-board, and is caused by poor erasure of marker writings. Ghosting not only makes the white-board to appear dirty, but it can renders marker scribblings invisible hence making the white-board unusable. However, if ghosting occurs on a wall with a white-paint, the owner only needs to properly repaint the wall with a quality dry erase paint, and the white-board is fully regenerated for future use. There are several basic painting principles that apply to dry erase paints, and they are described below. Still, to achieve the right application experience, it is mandatory for one to apply the dry erase paint according to the painting instructions laid down by the paint manufacturer. The painting principles explained hereafter a just but a rough guide of how one needs to apply the paint. To begin with, the surface to be painted needs to be properly prepared for painting. Generally, most dry erase paints performs best when it is applied to smooth painted surfaces (the paints needs to have dried completely or else it will mix with the dry erase paint a create a paint-stained wall). If the wall is textured, then it is recommended that it is skimmed by a drywall mud till a smooth surface is achieved. Also, it is recommended that smooth walls, which have some texture, be sanded using a 240-grit sandpapers so that an even smooth surface is achieved. Next, the prepared wall must be properly dusted so as to remove all the dust, because dust prevents paint from adhering to the wall surface. Afterwards, a masking tape is placed around the surface to be painted. When the tape has been laid, it is advisable for one to slide a flat object along the tape to ensure that creases and air bubbles underneath the tape are eliminated, and that the tape lays smoothly over the surface. This prevents paint from moving into crevices under the tape, which ultimately causes the painted surface to have a rugged edge. The prepared surface is now covered by a dust-free base coat of paint. Still, one can also apply a base coat on this surface using a paint whose color matches the dry erase paint. This base must dry completely, and 24 hours later, the dry erase paint can be applied. Before painting the well-prepared and properly base-coated surface, one must make sure that the ambient humidity is less than 50percent and the ambient room temperature ranges between 20-25degrees centigrade, as well as make sure that there is no heavy foot traffic as this can kick up lots of dust. The dry-erase paint is best applied using a high-density and ultra-smooth micro-fiber roller. Some paint brands ship the roller along with the paint, hand glovers, stirrer, and the step-by-step painting instructions manual. Also, it is recommended that one uses a low-odor marker to write or draw on the painted (white-board) surface. Others markers that can be used to write on these white-boards include dry-erase markers, washable markers, crayons, Crayola markers, and permanent markers.